More than 120 invited guests were the first to hear about Shirin Fozdar Programme’s (SFP) plans and to witness the birth of a new SMU alumni group, at the SFP Evening held on 11th May 2016 at SMU’s University Lounge. The Shirin Fozdar Programme (SFP), resident in SMU, facilitates the advancement of women in Singapore. It was established to commemorate Mrs Shirin Fozdar, an outstanding Singaporean woman who contributed vitally to women’s rights. At the cocktails and networking event, Chairperson of the SFP Ms Claire Chiang outlined the milestones and the future of the SFP. SFP’s mission is to continue to serve as a platform to connect students, advocates, policy-makers, businesses, institutions and the public to shape a resilient community and nurture integrated perspectives in women’s development. It was very apt that the SMU Women Alumni Group was launched at the event. Supported by the SMU’s Office of Alumni Relations and the SMU Alumni Association, the newly formed group brings the total number of SMU alumni groups to 29, serving and bringing together over 17,000 SMU alumni spread across the globe. 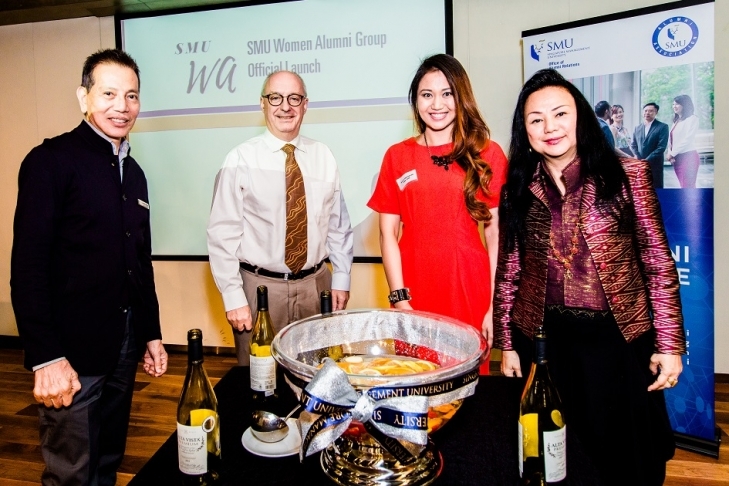 The Alumni Group aims to gather the voices of SMU alumnae on shared interests and issues. It will organise activities to help members grow; including social and professional networking, personal and professional development, social and cultural activities, mentoring of alumnae and students, and community projects. For more photos, visit the Facebook album on our page here. SMU’s Office of Alumni Relations spoke to President of the SMU Women Alumni Group Ms Anna Haotanto following the event and she shared more on the Group. 1) Congratulations on the launch of the SMU Women Alumni Group! How did the idea of forming the Group come about? What are its objectives? I am in a few women’s networking communities outside and I think they are a great support system. I was talking to some friends and realised that SMU lacks a group that further women causes. It’s also a good way for us to reconnect, network and help each other. SMU Women Alumni Group (SMUWA) seeks to gather the voices and interests of its female graduate community, and in doing so, support and further the role of women as leaders and active members of society. The Group will explore issues pertinent to women, particularly in the areas of personal development, family matters, financial literacy, and career advancement. With 16 years of an estimated 9,500 female graduates, the Group has the potential to become the biggest alumni group and make a significant impact both on supporting the female graduate community and inspiring SMU's female undergraduates and young female students to join SMU for a fulfilling education. lives including, but not limited to: women’s health issues, family matters, financial literacy and career advancement. iv) To inspire members to pursue their aspirations and stay true to their authentic selves. 2) We love the symbolism of fruits used to signify the launch. Tell us more about the fruits and what they represent. The special cocktail concocted in commemoration of the launch, underlined the strategic focus areas of the newly formed female graduate community: health, finance, family and personal development. 3) What are the plans for the Group? Any upcoming events? SMUWA's first Executive Committee will strive to organise two to three events a year for its women alumni members as well as to foster the growth of an online community via social media to keep its members informed of its latest news and developments as well as current affairs issues that concern the community. The first event will be a talk and networking session by a few prominent leaders who are able to provide advice on the struggles of female professionals in the workplace. Our second event, which I’m extremely excited about, is our signature event - a half day summit that will offer our members the opportunity to learn from, and be inspired by, a panel of accomplished speakers who are able to share their real-world experience, advice and tips for our members to tap into for personal and professional growth. 4) How can one find out more and join the Women Alumni Group? To ensure that you stay ahead of all the latest updates regarding the SMUWA group, please subscribe to our Facebook page at https://www.facebook.com/smuwomenalumni and stay tuned for the details of our upcoming events. 5) Last but not least, I'm sure many are curious to know, are men allowed to join the Group?